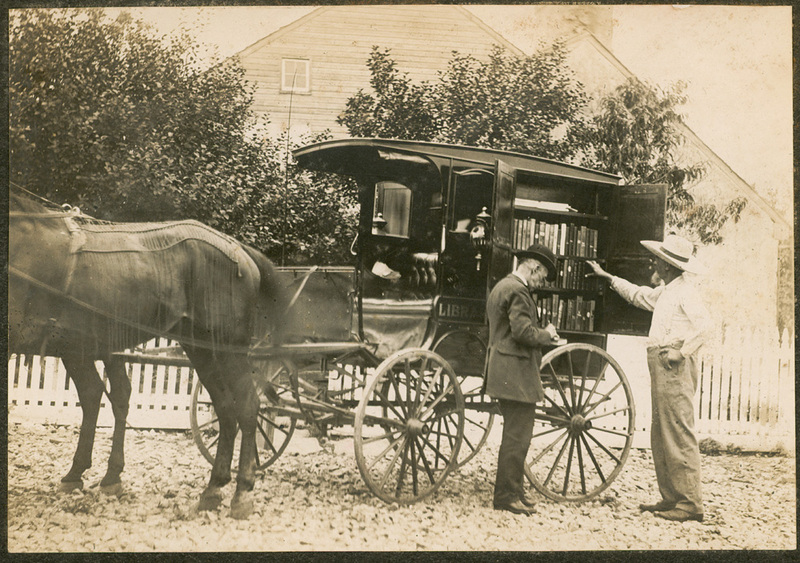 Established in 1905 as the first mobile library service in the nation, the Washington County Free Library Bookmobile continues the proud tradition of serving patrons who do not otherwise have access to library services. The service is open to all citizens of Washington County, Maryland, but the focus of the service is children and senior citizens. Where does the Bookmobile go? We visit public, private and home schools, daycare centers for children, adults and challenged individuals, nursing homes and retirement communities as well as neighborhood and community stops. The Bookmobile carries approximately 4000 items consisting of books, large print books, magazines, DVD's, and books on cd. The Bookmobile does not carry music CD's, however patrons may request those items. The collection is about 70% juvenile material and 30% adult material. Patrons may also request material from other branches or through inter-library loan. How does Bookmobile service work? The Bookmobile visits stops once per month and books are checked out until the following month. The Bookmobile uses the same library card as the rest of the library system. Bookmobile service is free to residents of Washington County (MD) and there are no fines on overdue materials. The Bookmobile does charge for lost materials. How do I get a Bookmobile stop? Bookmobile stops are established on a first come, first served basis according to schedule availability. To get a stop at your home or neighborhood, you must agree to check out a minimum of 15 books per month and there must be ample space for the Bookmobile to turn around and park. If you are interested in a stop, call, write or email the Bookmobile Department. Contact information is listed below. Is the Bookmobile easily accessible? The Bookmobile has two doors with drop-down steps and sturdy handrails. It also has a wheelchair lift. If the snow emergency plan is in effect, the Bookmobile does not run. All books are renewed and there are no charges. The Bookmobile will visit again the following month. The Bookmobile does not make up snow days. Does the library offer outreach services? Yes, the Bookmobile staff services homebound patrons and deposit sites throughout the county. What is a homebound service? Homebound service is for individual library patrons who cannot use the main library or branches due to physical limitations, age, or lack of mobility. Patrons must agree to use only the Bookmobile for library service. Depending on scheduling and availability, library staff may provide homebound service using either the Bookmobile or one of the library vans. Qualifying patrons are visited once per month with specially selected materials. Visits are limited to 30 minutes. A deposit site is a location where a group of readers would like books but the location is inaccessible to the bookmobile. A bookmobile staff member packs a collection of books and delivers them to a pre-arranged location within a facility. Locations that qualify include, but are not limited to, nursing homes, assisted living facilities, adult daycare centers and detention facilities.